Blueberries are perennial flowering plants with indigo-colored berries from the section Cyanococcus within the genus Vaccinium (a genus that also includes cranberries and bilberries). Species in the section Cyanococcus are the most common fruits sold as “blueberries” and are native to North America (commercially cultivated high bush blueberries were not introduced into Europe until the 1930s). Blueberries are usually erect, prostate shrubs that can vary in size from 10 centimeters (3.9 in) to 4 meters (13 ft) in height. In the commercial production of blueberries, the smaller species are known as “low-bush blueberries” (synonymous with “wild”), while the larger species are known as “high-bush blueberries”. 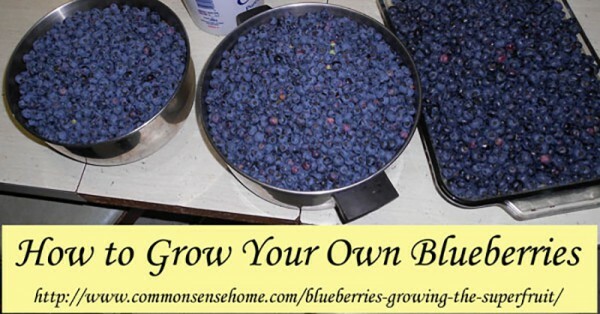 Did you know that there is a way to grow your own blueberries at home? We will show you an easy way how to grow buckets full of blueberries at home. It is always a nice thing to have your own fruits or vegetables grown at home because you know that they are 100% natural, with no hormones or any unwanted substances. A lot of people fail to grow blueberries at home. That is why we have prepared this article, to show you the right way how to grow buckets full of blueberries at home. As mentioned before, growing your own plants, vegetables, or fruits has a lot of benefits. First you know that what you eat is 100% healthy and natural, with no additional flavors, hormones or pesticides. Secondly, you do not have to get dressed and purchase them from the store, because you have them nearby at all the time. Blueberries are full of vitamins; they are loaded with antioxidants and phytonutrients that benefit every system in our body.